Wireless links - be it catapulting footage from the cockpit of a Formula One Car as it reaches 180MPH into a knifepoint turn, or feeding a screen in the serene landscape of Scotland's world-renowned links for this year's Ryder Cup - Radio Frequency (RF) links have taken a major foothold in recent years in the outside broadcast field thanks to improved reliability of the related technologies, such as the evolution of COFDM, better methods of compression, controllable guard intervals - or better focusing of emitted microwave radiation - to name just a few. In this article, we'll be taking a look at the fundamentals of these links in order to gain an understanding of how they can be more effectively used. Early, analogue, methods of creating a wireless link are still indeed in common use today - and can prove a cost-effective method of passing data between two points - so long as a clear line of sight is maintained, and there are no structures that stand to reflect the signal (i.e. a metal bridge, or a glass building), which could ultimately lead to signal degradation known as Multimode Propagation - which tends to manifest itself in terms of image jitter, or ghosting (in which images on screen have a 'ghost' of themselves to the right of the original image - caused when part of the signal is received on time and accurately, whereas another part of the signal reflects off of on object, and thus takes longer to arrive at the antenna - causing the 'ghosting' effect.) Other types of wireless signal degradation (or 'fading') could include Path Loss - wherein a signal loses part of it's intensity the further it travels through space - and Shadowing - whereby, again, the signal is attenuated - but this time as a result of a physical obstacle causing diffraction, reflection and scattering. 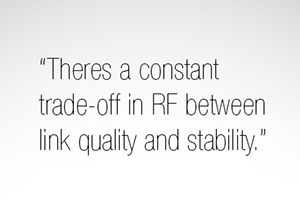 However, in the past two decades, we have seen the advent of digital-type wireless links utilising Coded Orthogonal Frequency Multiplexing (COFDM for short) - which not only removes the requirement to ensure line of sight transmission, but also affectively terminates the risk of encountering the effects of certain types of fading such as multimodal propagation thanks to advanced error correction techniques . In order to gain a better understanding of this advanced technology, we need to first cover the fundamentals - namely - how do we wirelessly transmit digital data? 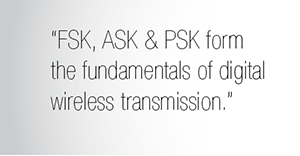 In essence, there are three fundamental way of doing this; FSK, ASK - and PSK. This, of course, provides the floor of only providing one binary digit (or bit) per symbol, meaning that for higher data rates very high frequencies have to be used. However, by combining a few of the aforementioned techniques, more bits can be added to each symbol. This can be identified through another term often thrown around in wireless world - 'QAM'; more commonly denoted as '16-QAM', '32-QAM' or even '64-QAM'. In this instance, let's look at 16-QAM (or 16-State Quadrature Amplitude Modulation). Firstly, looking back at PSK - we spoke about altering phase in order to change the data output of the carrier. Studying Figure two (top half), we can see that phase can be determined by where the sine wave starts (hence the red '0 degrees' wave starts as zero, whereas the green '90 degrees' wave starts at the 90 degree point on the graph). 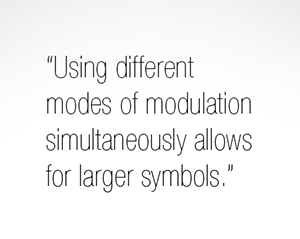 With this in mind, we can modulate the phase of a signal to point at one of the 4-bit binary nibbles (i.e. 45 degrees for 1010 and 1111, 15 degrees for 1011 etc, as per the bottom half of fig. 2, ensuring to work from the horizontal plane, anti-clockwise as we are working in radians). You may have already noticed that this doesn't completely resolve the problem though - note how the 45 degree modulation would give us two different symbols? This is true for another point on the map as well - and that is why we also use the ASK fundamentals in this mode of modulation. For example, if you wanted to point at 1111 (red arrow), you'd use the 45deg PSK, and, say, 20% of the full signal amplitude (which can be imagined by drawing a circle around the outside of the 16-QAM Gray Code Map - where touching the circle would require 100% of the original amplitude.) If you wanted to hit 1010 (blue arrow) therefore, you'd use the 45Deg PSK - but this time use 100% of the permitted signal amplitude in the ASK realm, allowing you the ability to hit the desired symbol. It doesn't take much imagination to subsequently figure out how 32-QAM and 64-QAM systems work. In a nutshell, they simply have more 'layers' in both the angle and amplitude domains, allowing for an even greater number of bits to be transmitted per symbol (although do consider that, as the spacing between the bits is considerably smaller, the chances of an error being induced is considerably higher - so there is a trade off between quality (more bits per symbol) - and reliability (allowing enough space between each set of 'bits' to ensure that interference induced into the signal doesn't cause a false reading). So, where exactly does COFDM come in to all of this? As is, looking at just using a 16-QAM system, considering that each symbol contains just 4 bits - and that the average frame can be a up to a few hundred of Kilobytes in size (assuming compression is in use and there are 25 frames in a second) - it can be seen that a lot of 'symbols' - potentially hundreds of thousands - need to be sent every second - which means the 'symbol time' (or the time window in which each unique 'nibble' of information is received on its own before the next one arrives) must be very small indeed. But what about multi path? We've already established that not all of the signal will travel directly to the receiver, and some of it will bounce off of physical object such as buildings, vehicles and people - delaying its journey. Now we run the risk of the symbols 'clashing' with each other (if you'll pardon the pun) as a result of the 'delayed' information running 'late'.